Let's get this part out of the way - I received a copy of Brown Eggs and Jam Jars from Penguin Canada in exchange for posted images on my social media platforms. I was not required to write a review, but I LOVE this book so much that I definitely want as many people as possible to know about it. Aimée’s rural-homesteader upbringing, years working as a professional chef, and everyday life as a busy mom led to the creation of the hugely popular blog Simple Bites. Raising three young children with husband Danny, Aimée traded her tongs and chef whites for a laptop and camera, married her two passions—mothering and cooking—and has since been creating recipes with an emphasis on whole foods for the family table, sharing stories and tips, and inspiring readers to make the family–food connection on the Simple Bites blog. 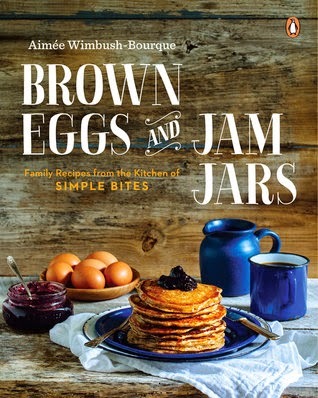 Brown Eggs and Jam Jars is Aimée’s long-awaited cookbook, inspired by her urban homesteading through the seasons and the joyous events they bring. It embraces year-round simple food with fresh flavours, from celebrating spring with a stack of Buttermilk Buckwheat Pancakes and pure maple syrup, to a simple late-summer harvest dinner with Chili-Basil Corn on the Cob and Lemon Oregano Roast Chicken. Autumn favourites include Apple Cinnamon Layer Cake with Apple Butter Cream Cheese Frosting, while Slow Cooker Cider Ham is the perfect comfort food for those cold winter nights. But that’s just a few of the more than one hundred recipes (like melt-on-your-tongue maple butter tarts and tangy homemade yogurt) that have a touch of nostalgia, feature natural ingredients, and boast plenty of love. Brown Eggs and Jam Jars will inspire readers to connect family and food right where they are in life—from growing their own tomatoes to making a batch of homemade cookies. Enjoy your urban homestead. I've had this book for just over three weeks and it arrived at the perfect time. One of JG's resolutions this year has been to eat healthier since he overindulged while I was pregnant with baby #2 a.k.a. Micro JG. The beginning of the book introduces you to Aimée, her family and her experience in the kitchen. The book is then broken up into the four seasons and within each section are recipes that are best suited for that time of year. Although, if you can find the ingredients, there's nothing stopping you from making a refreshing summer drink in freezing cold winter. I made this Cucumber Honeydew Agua Fresca (p90) a couple weeks ago. The tequila I added in later kept me warm. With that said, it makes a delicious margarita mix! I have a row cookbooks and baking books on my shelf that are really terrifying. Some ask for ingredients that I can't find in a regular grocery store, others make me feel like I'm in my high school chemistry class and then there are the books that have recipes that take upwards of 8 hours to prepare. I'm lucky if I get an hour to prepare a meal. One of the things I love about this book is its simplicity. As I flip through the pages, there aren't many that I've found intimidating and the amount of time required is reasonable. 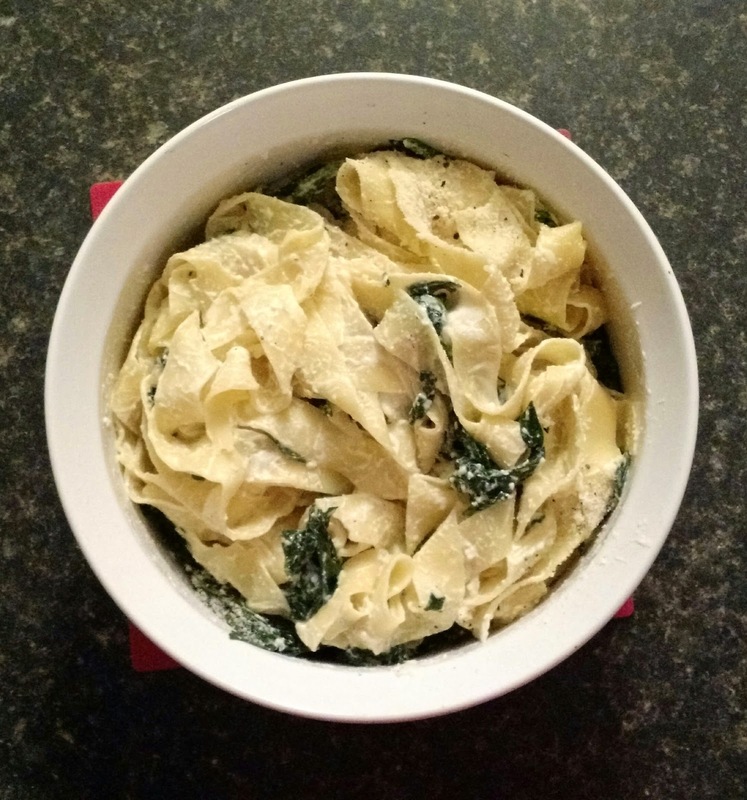 My new go to recipe is the Spinach And Ricotta Pappardelle (p36). It's so easy to make and if you're organized it takes less than 10 minutes. I also appreciate Aimée's notes at the bottom of most recipes outlining how long each meal can be kept frozen or refrigerated. They're helpful now and I'm sure I'll be using them as a guide when I head back to work at the end of the summer. Lastly anyone who's come over since we've received the book have commented on how beautiful it is and I completely agree. Aimée's recipes are brought to life by photographer Tim Chin. His ability to capture the food as well as Aimée and her family are impeccable. Brown Eggs and Jam Jars was actually promoted in our house. It's now one of our coffee table books. It's just too pretty to be stored on a shelf. If you're looking for a new cookbook or need some new inspiration in the kitchen, I highly recommend you give this book a chance. To learn more about Aimée, stop by her blog Simple Bites. She has some great cooking tips and of course recipes posted. I've been eying her recently posted slow cooker recipes for the past week. There's a good chance one of them is going to make it on next week's meal plan. I also recommend stopping by Tim Chin's website The Chin Family Eats. You'll find some photos of food that will make your mouth water and get a behind the scenes look at how the stunning images in Brown Eggs and Jam Jars were shot. Have you picked up this book or tried any other recipes from Simple Bites recipes? Let me know. I'd love to hear about them!